"He had a Kingly crown; and yet upon no head visible was it set. The red fires shone between it and the mantled shoulders vast and dark." We all know of the plant Athelas mentioned in Tolkien’s works, as a plant that grows wherever Men of the West camped or established buildings in Middle-earth. It has a sweet, pungent smell when crushed and small white blossoms. We see the representation of this plant in the Fellowship of the Ring movie, when Aragorn looks for it to help with Frodo’s Morgul knife wound. But could there not be a modern representation of this plant? Well, the answer is yes. While looking through a book on wild plants, I stumbled upon one that looked very similar to athelas. 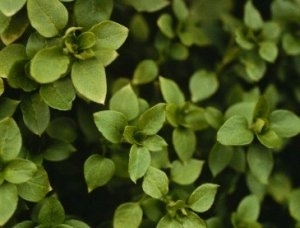 It has small white blossoms and grows in clusters on the ground. And to my delight, it also had many medicinal purposes. So, here is a valuable herb you could plant to look like athelas. 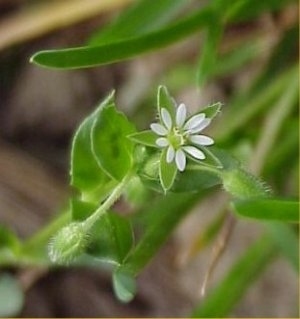 Its name – Common Chickweed. Description – A strong, hearty annual, this plant grows with entwining, clustered stems, or sometimes upright stems. Thriving in even the coldest of winter, and living despite the efforts of weed killers, it can be considered a pest to gardeners. It starts blooming in winter, and finishes seed production during spring. It’s small white blossoms only have five petals, though it looks like more, and ten tiny stamens, and usually only open on sunny days. Habitat – Can be found far north in Alaska and Greenland, and on down into Canada and the United States. Medicinal Purposes – If you once considered this plant a pesky garden weed, you are sadly mistaken. This plant, much like athelas, is often called a weed, but it has many medicinal purposes. It is said to be an “antiscorbutic” meaning it can treat or prevent scurvy. This may mean it has some kind of Vitamin C content. But of that, I am not certain. It can be gathered fresh and put into bubbling water, and some say it makes a good poultice. It helps with inflamed or irritated skin, swellings, cuts, infections, and even hemorrhoids. It can also help with ulcers, boils and carbuncles. The water can also be used to was the area of need. 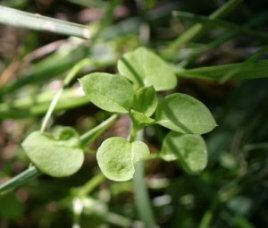 Chickweed can be used as a salad green and is often fed to birds, since they seem to enjoy eating it. It is also made into teas and salves, and at one time, was taken internally for lung complications and arthritis. And for blood poisoning, it was taken internally and used externally. Although it has these similarities with athelas, it is only lacking in one thing. The pungent smell. I found no mention of any fragrance, though it may have one. But altogether, this plant would make an excellent addition to anyones yard as an example of athelas. Though, it probably would not be advisable to put it in your garden area, since it may become an unwanted guest. Planting it in a pot or urn would be advisable. If another plant can be considered more alike to athelas, I will update this article as soon as possible. Special thanks to PotbellyHairyfoot for his help and advice. AWESOME. I will totally grow this this year! My understanding from the reading I’ve done is that Athelas was in the mint family, most of which do have very pungent odors. Mint itself does produce clusters of white flowers depending on the time of year. The taxonomic family to which they belong is Lamiaceae, if you were interested into checking into that. Hyssop in particular seems like a good comparison candidate, though the white flowers seem to be rarer. What about lemon balm or self-heal? Those are both in the mint family. Lemon balm is antiviral and its scent banishes melancholy. But honestly, I don’t know of any plant that is exactly like athelas. I have found several clusters of a plant that no one can seem to identify. It has a sweet, strong smell, and many star like flowers. It seems to be a perfect copy of athleas, and I can’t seem to find out what it is, it has thin leaves and stems, yet they are very stiff! What could this plant be? Chickweed? I was thinking Athleas was more like Basil or some herb. this is awesome! would it grow in VT?